This cavernous building is where Xanadu's wood harvests are transformed into both raw lumber for building and wooden products for personal use. Upon stepping into the enormous place, the pungent tang of sap, fresh wood and sawdust permeates the air. Rarely quiet during peak hours, the whine of the giant buzzsaw with the banging of hammers and chisels makes carrying on a conversation in here difficult, if not impossible. Racks around the perimeter is where the different grades of planks, dried in the huge kiln out back, are stored for further curing. In the back are work benches with neat racks overhead with an array of handtools for creating smaller items of fine craftsmanship. There, the acrid odor of oils and stains for finishing is quite strong. 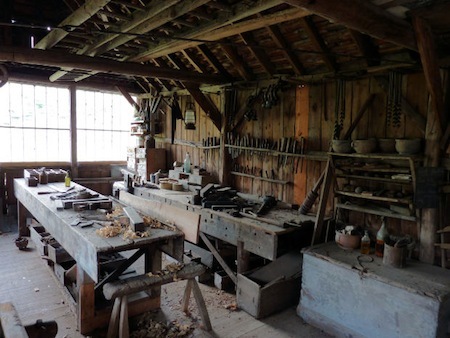 No matter the season, the woodcraft shop buzzes with activity. Literally! A buzzsaw somewhere near the center of the room makes its noise as a crafter skillfully cuts long planks of wood into shorter versions for apprentices to shuffle away. The air smells of wood and the products of it, and it's warm in here compared to the chill of outside. The afternoon sun is bright though despite the cold, making the day a brisk yet cheerful one. Ka'el is here, speaking to a Journeyman in the back away from the lumbering portion of the place and closer to the areas in which goods are made. It's quieter away from the buzzsaw where the workbenches are, and the Weyrleader and rough-faced Journeyman are able to converse without too much trouble. Ka'el is waiting, blue eyes shifting to the entrance to the place every now and then. Some women somehow manage to seem vaguely graceful even in the later stage of pregnancy, but between being in that late stage and the cold weather aggravating her bad leg, Marel is not (at least today) one of those women. Her progress towards the woodcraft shop has been slow overall, so she might be a little bit late for the agreed upon meeting time, and where she doesn't look graceful, her saving grace is that she doesn't look rushed or out of breath, her appearance otherwise as carefully tended to as ever. When she appears in the entryway to the shop, she pauses for a moment or two to lean against the doorframe, her gaze seeking out Ka'el's somewhat apologetically. "If you'll excuse me," says Ka'el politely to the Journeyman, who seems not at all put off as he's left. Meeting with those of fancy knots isn't really his forte but…he's a Journeyman! It happens. Ka'el moves off towards the door, having spotted Marel not long after her arrival. He smiles as he reaches her, moving nearer to her side so that he may be used in lieu of that doorframe. "I apologize," he says with a smile to match his words. "I forgot how somethin' as simple as walking turns into a chore now." Not that she seems in the least bit winded! "I'm glad you've made it! And we're lucky. Today, there's only one person hacking away at the wood. Usually, there's three or four. Sounds like a madhouse in here most of the time." He grins, offering her his arm if she so wishes the support. "A bit more walkin' though, I'm afraid. To the back." "Don't apologise," Marel insists, giving a little shake of her head. "It's not as if I should spend the next while confined to my living room while I send people out to run errands. I'm sure some people would get a kick out of that sort of thing, but I'm rather certain I'd run to madness before long." Today, her pride doesn't stretch to refusing his offer of assistance, and she carefully loops her arm through his, momentarily easing weight from the leg that won't co-operate as well as the other. "Have you been running through here and intimidating people already?" she teases, acquiescing to the need to carry on through the shop by taking a half-step forward to indicate readiness. "It's actually quite fun," Ka'el teasingly replies, brows lifted a fractional amount as he watches her. "Lounging on the sofa while running folk to and fro. It's as if your hand were an instrument of magic.." he says, giving his a playful wave as if it were a wizard's wand. He laughs afterwards, shaking his head before he moves forward with her. "Haha, in truth I don't blame you. Time off is only fun when you can do what you want with it." He takes the long way around the buzzsaw to save their eardrums from wanting to burst with the level of noise, also sparing their noises from being bombarded with fresh sawdust! "You're coming along.." he notes with a brief look to her swollen abdomen. "Have you been keepin' to your appointments with the healers?" he asks only because experience gave him the knowledge to know that those are thing. Though the noise is minimised by the route chosen, Marel still flinches away from it and shoots a half-hearted glare in the direction from which it originates, no true malice there. "Yes," she sighs obediently, pretending to be terribly put upon by the enquiry alone. "I turn up, they ask me all sorts of silly questions, like women haven't been having children since, I don't know, the beginning, and then they let me go away again." She idly kicks out at a trail of sawdust that looks like it's been around and trodden on for a while. "I mean, either it will all be okay or it won't. I know none of it will be how I wanted it to be, so the best I can hope for is for it to be okay." Ka'el laughs and gives his head a small shake. "You sound like Soriana," he notes amusedly. "She didn't care for the healer visits either, but we went to them all. The questions, the feeling and listening.." he smirks at the memories. "I suppose they know what they're doing, and if they haven't told you anything was concerning, I'm sure it'll be okay." The smile he gives to her is an encouraging one. "You know, if ever you want company on any appointment that you have left, I don't mind going with you. It may feel a little less tedious to have someone to roll your eyes with." They're getting closer to the work area now, where small projects line shelves, finished and not, with bigger ones resting on the floor. That Journeyman is still there, having busied himself with giving orders to the few apprentices that are here today. "Ma'am," he greets, voice as gruff as his appearance, though he has kind eyes. Ka'el slows their walk to a stop. "Surprise, Marel, today is a gift-giving day!" announces Ka'el. "You're here to give your input on your baby's new crib. I hope someone else hasn't already gifted you with one." Marel's smile is warm in the seconds before it turns wry. "No offense, but being stuck there like a Pass-heavy queen with /more/ witnesses to the fact isn't something that I think what remains of my pride could handle," she answers just loudly enough to be heard over the saw. She ducks her head down to rest it against his shoulder for a moment, offering a hug without an actual /hug/ as she adds a genuine, "But thank you. You-" And that's about as far as she gets before, between the Journeyman and Ka'el's explanation, she's hushed to silence. She stares, in what she would term an undignified fashion, and then tries to speak, but no words come out. "You- No, they-" is a slightly more successful attempt. "Are you sure?" "Of course I'm sure!" laughs Ka'el. "We can't let this child come into this world and not have a place to rest his head, right? And when it comes to picking the type of wood, to stain or keep a natural finish, and the overall look, who better to decide that than the mother? If left to me, I'm sure I'd create something you'd rather burn as firewood than use as a bed." His voice is elevated to be heard over the buzzing of the saw, but miraculously, after that, it goes quiet. Break time! (Just in time!) The Journeyman now speaks up, gesturing to samples of wood that have been laid out on a table. "When yer ready ma'am, these are th'woods we have currently. Iff'n you have somethin' else in mind, we could get'm imported, but might take a lil' longer.." Cherry, oak, ash, pine, birch, mahogany, and maple are options. "You are," Marel opts not to say were, "a crafter; I doubt that you could design something truly hideous." But maybe those words are just to buy her time and to settle down the instinct to give him a real hug now, for she moves an inch or so closer before suppressing the urge. Not in-front of the Journeyman. Her sigh of relief when the sawing is silenced is audible now that that noise isn't there, and her cheeks colour a little, embarrassed. "Thank you," she murmurs to Ka'el, then turns her attention to the choices given her, as much to be polite as to not do something silly, like cry. "Cherry's nice and dark, but not too much. I think it would stand up to wear and tear better." The smile that Ka'el gives to her is warm, happy to see an expression on her face that's far from her usual guarded neutrality. "No thanks necessary," he answers, giving her arm a squeeze before letting her go to inspect her options. He follows along, glancing at the different shades and textures of wood. He definitely does have a crafter's eye, even though he's more keen to metal than wood. But he has his preferences. Fingers reach to touch, pausing on cherry as she comments on it. He nods in agreement. "I like the reddish look to it. Would fit either a boy or girl," he comments with a smirk to her. "The oak might match the hues've your weyr, but my vote's cherry too." The Journeyman lingers by that particular wood, flagging down an apprentice to come with a pad and writing utensil. "At least everybody would be able to note where the baby is if the crib is darker and stands out," Marel utters a little dryly, angling a quick look up at Ka'el. "I'm sure there are many who might assume I've gone and tidied it away with everything else. You know, nice and neatly in a drawer somewhere." Yet there's a certain apprehension audible in her voice that betrays that she knows full well that no baby is going to be tidied away or much of tidy at all. She gives a polite nod to the apprentice, not the sort to ignore their existence and only pay heed to the Journeyman. "…Can the crib be placed on rockers or does it have to stand still?" Back to Ka'el: "Does Skyler's stand still?" "Mmm, I've a feeling the baby will have a knack of making himself the center of attention no matter what sort of crib he's in." Or she! But the 'he or she, his or her' thing can get tedious after a while. He crosses his arms, making a thoughtful face. "Though if when I visit and things are peculiarly quiet with no child to be seen, I'll be sure to check the drawers." He grins now, also acknowledging the apprentice with a little nod. And it's he, the apprentice boy, who answers Marel's question. "Oh, it can be on rockers! We've built plenty that way. Would y-.." Oops! He's talking too much and a stern look from the Journeyman is all that's needed for him to clamp his mouth shut and instead write down the wood type. Ka'el smirks at the exchange as he answers Marel. "Skyler's stands still. We've a rocking chair in his room, and we rock him there before puttin' him down. A crib with rockers is a good idea, though." Marel appears perfectly happy to listen to the apprentice, though she shoots him an apologetic look of her own when his Journeyman effectively silences him, one she tempers with a smile much kinder than that stern look delivered to him. "If rockers are an easy thing to build into the design, I'd appreciate it," she tells them both, though she's plainly worried about running up expense, given that proviso. "I don't know if there's a standard 'pattern' or design that goes with some and not others, but… well, the baby's going to be brought into a life that pretty much revolves around dragons and flowers…" And yet could be a boy or a girl, so maybe lots of flowers isn't such a good idea. For the next while, she's happy to talk designs and dimensions and all sorts, yet she remains wary of clocking up what she would perceive to be too many marks, and most often looks to the Journeyman or Ka'el before interjecting anything of her own. And at the end of it all, Ka'el does get his hug, and if she clings just a little bit, words are not always her friend at this sort of time.